Wandering around the internet yesterday I stumbled upon a website containing freeware maps for Garmin GPS units <link here>. The owner of the TalkyToaster website is Martin and he has produced various map sets for both ‘routable’ (eg, vehicle sat-nav) and topographic (eg, contour lines and footpaths) Garmin units. I’ve been using freeware maps from another source which have contour lines but not the public footpaths and bridlepaths. To obtain the paths I’ve had to trace them on the OS website and download them to the Garmin Oregon. Using these new map sets from Martin means this is no longer required. It appears much of Martin’s data is obtained from Open Street Map which is also free in the public domain. I’ve noticed not all of the footpaths in the area around Aldermaston Wharf are on these maps and there is a note inviting users to submit new data or amendments for inclusion. This will give me something to do on the Sunday walks. This morning Darren fitted the Earth Leakage Breaker (ELB) into the front port side wardrobe. It now sits on the opposite side of the bulkhead wall from the bow shore power plug. As a result of the alteration to the 240v wiring we now have the shore power cable protected. The ceiling trim was reinstalled and concealed the wiring after this photo had been taken. Just to recap on the reason for fitting the ELB. 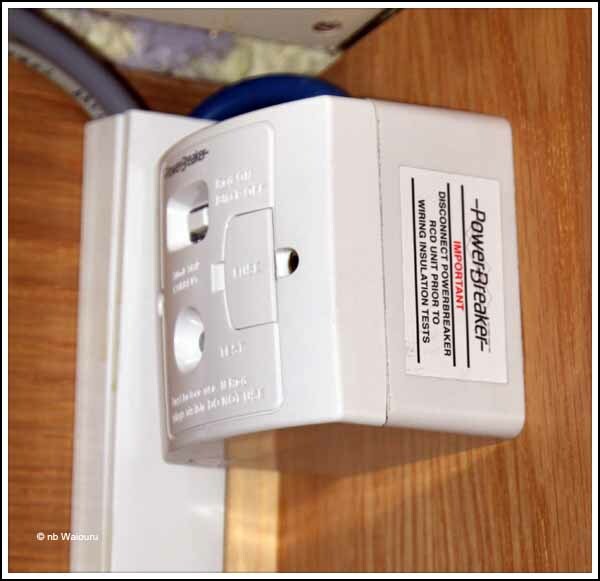 Barrie Morse, the marine surveyor advised us the cable from the shore power socket on the boat to the consumer unit us required to be protect under the relevant ISO (International Standard). 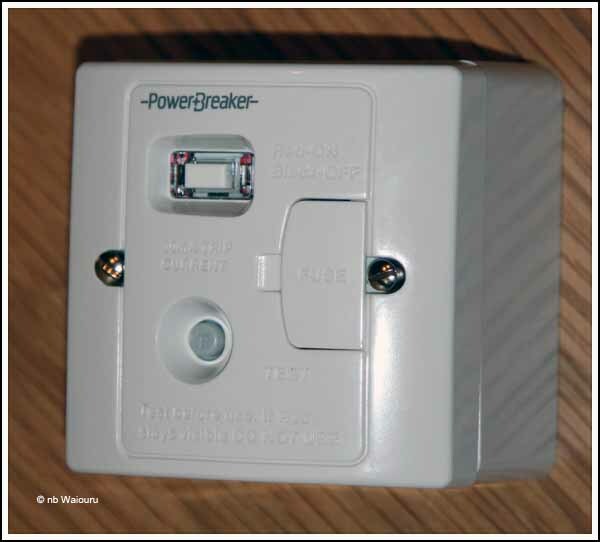 The cable must have a 2 pole 16A ELB unless the distance from the socket to the consumer unit is less than 500mm. The exception to this requirement is if the cable is contained within a conduit. In this case the distance can be up to 3 metres. Our bow shore power socket is almost 15 metres from the consumer unit hence the need for the ELB. After fitting the ELB Darren went on to make and fit a ‘swans neck’ into the sanitation hose. It has been installed immediately after the toilet and the object is to prevent the “contents” in the pipe flowing back into the toilet. Or more importantly preventing the contents of the pipe emptying into the bathroom if the pipe were to come loose from the toilet connection. More components arrived today and will be fitted tomorrow. We’re starting to see the bottom end of the “yet to do” list. Sorry but you have one big "yet to do" - go boating! LOL..... Paul, you're right (of course)!! !